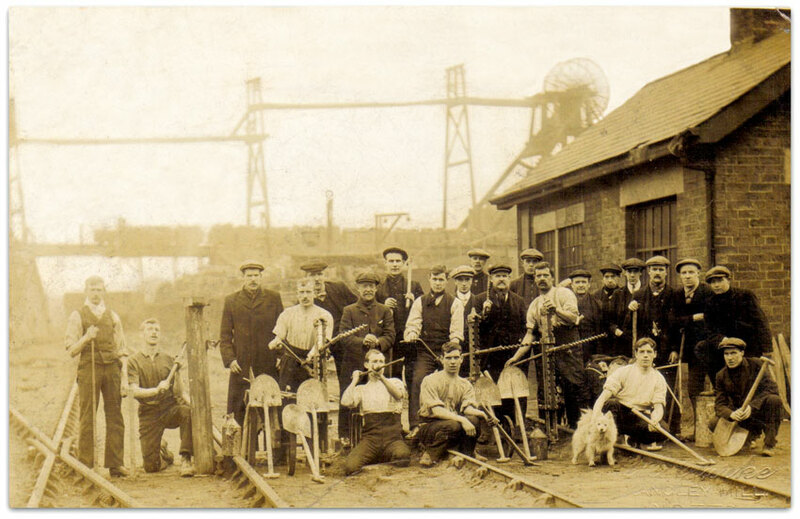 I have some information regarding my ancestors who all worked at Clifton Colliery in Nottingham. I was hoping you could include John Dickens name and details on you coalminers remembrance website, I would be extremely grateful if you could do this for me, could you please also include a red flower that would be great. I followed the contents link on the home page to Clifton Colliery and found the personal details listed for my great grandfather John Dickens including photos I sent you especially the one of my great nan Alice Dickens, thanks for doing this for me it's much appreciated it really is a brilliant website you have and its been my pleasure to forward information to you. Unusually there was a family named Dickens associated with the pit from its inception to its closure. William Dickens was a pony ganger 1966-1967. His father William Joseph Dickens was a ripper in headings from 1936-1968 and stayed on after the pit closed on salvage work till 1969. His Grandfather William Henry Dickens was a shaftsman from 1914-1943. His Great Grandad a colliery engine fitter from 1875 died at work on 2nd April 1909 aged 54. He was associated with the sinking in 1868. 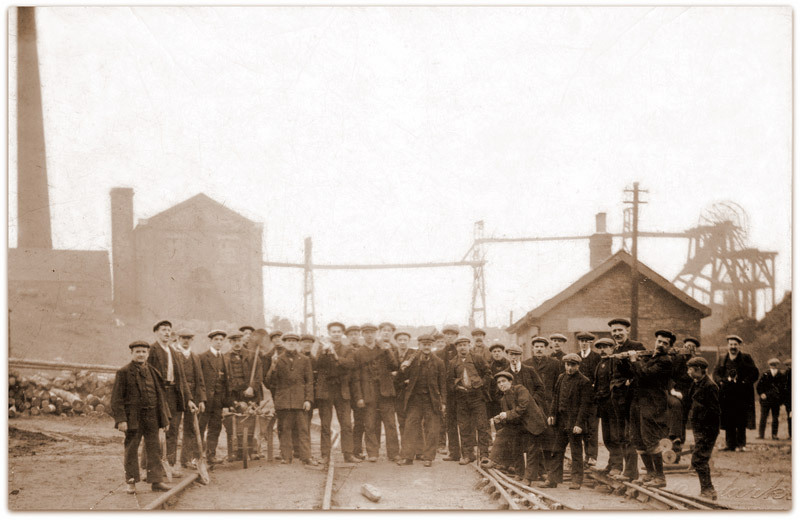 There cannot be many families with such a history at one colliery. 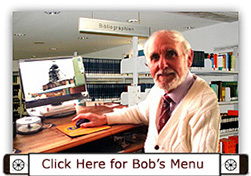 Found your great website today whilst researching my family tree. I found a posting by a William L Dickens (above) from March 2013 which refers to his Great Nan Anne Dickens and Great Grandfather John Dickens who died at the colliery. These are my great, great grandparents through another one of their children Rose Amelia. I wonder if it’s possible to pass my email address on to Mr William L Dickens so we could perhaps get in touch to share information on our ancestors. The article is posted here. Many thanks if you are able to make this happen. I'm interested in the article outlined below as I think it relates to my 3 x Great Grandfather. Do you know where I can obtain any more information about this accident and any details of George Rhodes' dependants left behind that may have been on record? Watnall (Barber Walker and Co), George Rhodes (c40) was sitting smoking his pipe down the pit when James Ison, another workman, asked him to push a piece of coal that was lodged against a prop supporting the roof but as he did so the roof bind gradually fell on him pushing his chin into his chest and when the lump of bind weighing around 1 cwt was lifted off him he was quite sensible but unable to stand. He perspired violently and complained of pain between his shoulders. He was taken home but died the following afternoon from his injuries, 10 Feb 1848. I came across your site when searching for 'New England (or Plumptre) Colliery. I am scanning my family photos and trying to find out more about my family. I wonder if you would like to see three photos I have of (possibly) High Park Pit, Brinsley ( or Moorgreen?) and/or New England. I also wonder if you have come across my grandfather's name MATTHEW WILSON or his brothers Ernest and John or brother in law Ted Hickling. Matthew was born 1891 and died in 1965. They lived in Langley Mill. Dad had a story of when his dad took him on a visit down the pit. A colleague asked Matt if his son was coming to work in the pit and Matt replied 'I'd rather see him shot'. That would probably have been around 1935. Maybe we can exchange a bit of info. It looks as though the men have collected their shovels (which they had to purchase) to take them home. They also have other tools such as drills etc. This was probably on their last day although they are all clean and fresh looking so have not just had a shift underground...this could be the day after when they were paid. If you look closely No6 is chalked on a couple of shovels to the left and 10s on the ones to the right. These were panel or district numbers and probably were the last faces worked. centre top is his brother in law Ted Hickling - below him is his brother. Matthew was a great singer and was in several choirs. Almost certainly a colliery one, Aldecar and/or Eastwood Church choir and Langley Mill and District Harmonic Choir (of which I have another photo c 1937). He also sang solos and in a quartet. 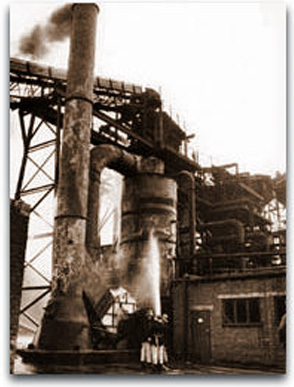 The colliery was named after the Reverend Plumptre an incumbent of Eastwood Church. Obviously most people later assumed it was called Plumtree and is often referred to as such. 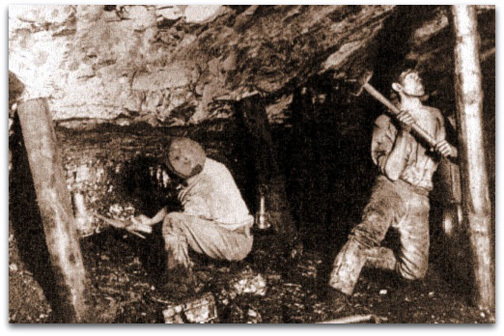 The pit did stop producing coal at the end of 1911 but was abandoned in 1912 so the picture would be correct. I would love to have copies of the photos to be able to put them in my history if they are different to a couple that I have. Can you send them to me by email so that I can try to identify them? There is some info regarding deaths, however I am continually researching and like your photos as more people read the site something else may crop up. I hope so. Hi I see on your webpage that a relative of my wife's died from falling off a roof. It's only taken us 2 years to find out why! (1) why would a miner be on a roof in the first place? (2) What probable height would he have fallen from? "Isaac Dexter accidentally killed 12 February 1907"
Photo of the 'Dexter Family plot' in Clowne Church's graveyard showing that Isaac died on the Saturday 13th February 1907. 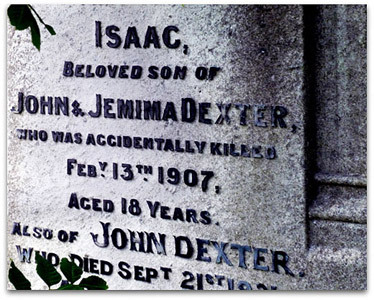 Isaac's accident happened on the 12 Feb 1907 and he did indeed die the following day on the 13th and not in July 1907. His death was (for some reason) resisted in the district of Sheffield, volume 19c page 334. I wrote this down several years ago but like a numpty didn't take the web address down but I remember it as a scanned image and his death was plain to see and it was defiantly Isaac. That said, doing a Google search isn't returning any results now...may be the webpage has been pulled since then. 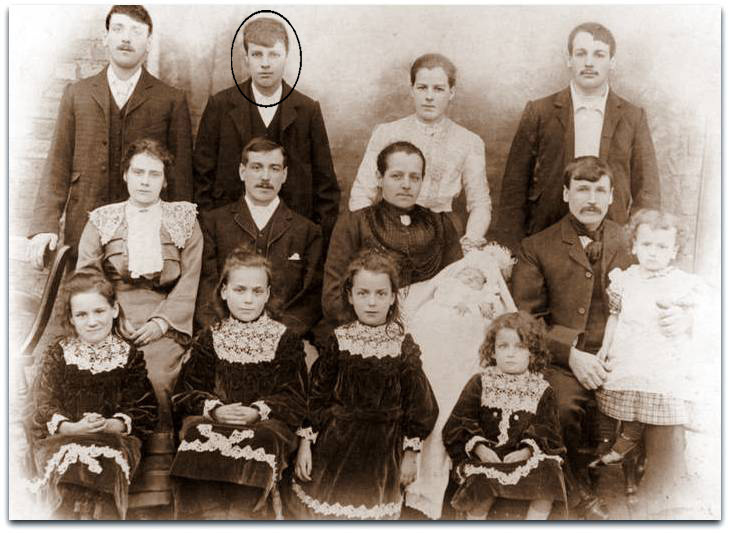 I have attached a family group photo and Isaac is circled - he was probably 12 or 13 here as we know the picture was taken circa 1901 / 1902. Hi Graham, Isaac didn't fall off a roof, it is the strange language the authorities used to report these accidents, what killed Isaac was the roof of the tunnel falling in or collapsing on him. An excellent learning experience, to learn more about coal mining, is a visit to the National Coal Mining Museum, Caphouse Colliery, Wakefield, junction 38 off the M1, sign posted after that, best to arrive around 10 a.m. Get a free escorted underground visit, see the ponies, visit the cafe. In reply to your email. Fionn asked me to give you a little more information. A fall of roof at the coal face is where the immediate strata above the area where the man is working on the coal face falls down and in this case Isaac Dexter (18) was buried under such a fall on 12th February 1907 but died from his injuries some time later on 13th July 1907. 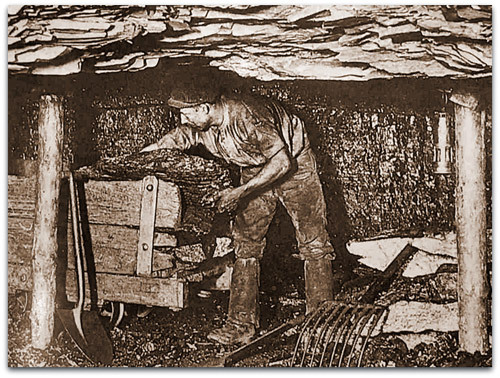 Usually it is very heavy stone or mudstone/siltstone etc that is immediately above the coal seam and even though props and bars are set under it sometimes that is not sufficient to stop a fall happening, however usually the colliers did not set the props until they had cleared some coal away as the props would be in the way whilst they were shovelling. Isaac was quite young and would have been inexperienced so may have taken more chances than he should have done. Old colliers would 'sound' the roof by tapping the roof above them with the top of their pick and if it gave a solid 'ring' sound they would know that the roof was safe however if it gave a 'dull thud' the roof could be unsafe as there could be a parting above that is not visible. This is when the roof could fall and it is imperitave then to get some props set under it as soon as possible. It is possible he was doing this at the time. In 1907 only wooden props were used (and split bars occasionally, that is a prop or tree trunk sliced down the middle and set with the flat side to the roof with a prop about 6" (0.15m) diameter set tightly under it). A wooden prop could also give an indication as to the state of the roof as they would tend to creak if the 'weight' was coming on when the props could also tend to split and collapse. This indication gave one chance to move out of that situation. The props were usually cut to about a couple of inches (0.08m) leass than the height of the seam so that a cap lid (a square piece of wood about 6" (0.15m) square and up to 3" (0.08m) thick) so that when the prop was knocked into a vertical position with a big hammer the prop and the lid would squeeze together and form a tight bond but as seen in the photos there was no real regimented pattern as today. It was up to the individual collier to set supports as he felt fit and obviously many did not set sufficient as thousands were killed over the last 150 years. At Southgate the Top Hard seam in which he was working was 5' 4" (1.625m) thick so the stone that fell on him would have fallen from above that height. Hopefully the 3 photos will give you an insight into face work and of course colliers then did not wear hard hats or use any form of protection as you can see. 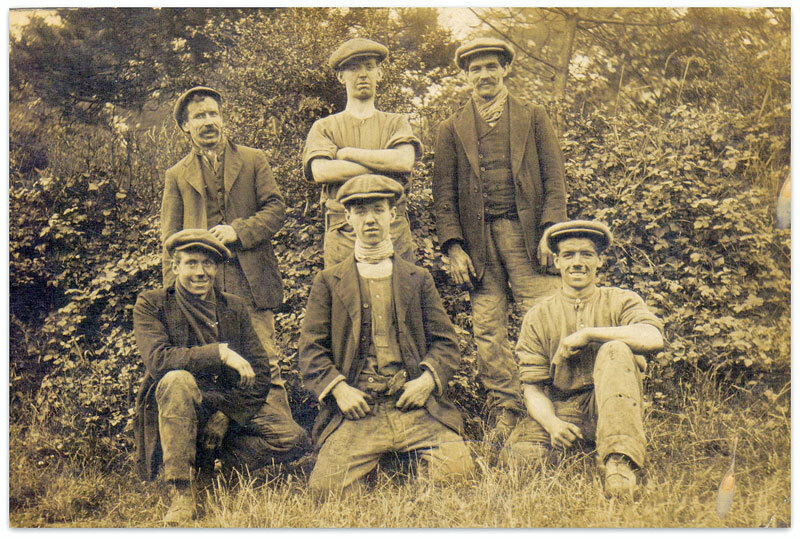 All are wearing ordinary cloth flat caps. 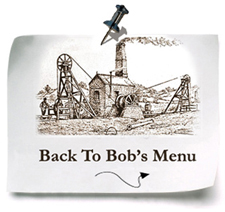 The fork (or screen) was used at times so that only large pieces of coal were loaded out as small coal that would fall through the tines on the fork had no market and even if it was sent out of the pit the man who lost it would not be paid. The tubs or jotties were marked with a number so the weighman on the surface would know where it had come from. 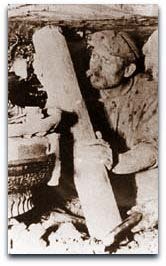 The centre photo shows a man loading a very large piece of coal by hand but also can be seen several large lumps of dirt that has fallen from the roof. Trusting this information is helpful. I came across your very interesting website recently. As a relatively recent entrant into the bug of genealogical research, thanks to my dad, One of the branches I've been researching is the Shores from Heage. A number of generations of Shores, from about 1850 to 1919, ran and operated a milling business in Heage. 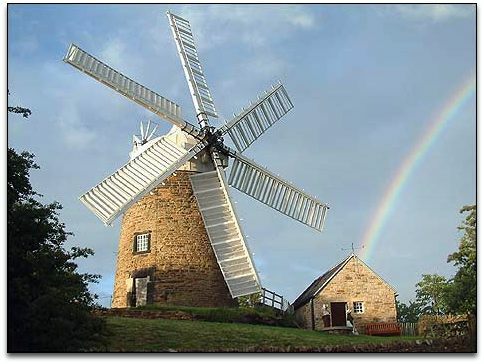 In addition to the well known Heage windmill, which survives and is restored and operating today, they had a combination steam and water powered mill down the hill, on a small creek. The business was one of the few tri-powered mill operations in England. The latter mill is no longer there, or renovated into oblivion, although the location is known. As part of the operation, there were two mines that I have come across that the Shores are listed as owning, and (according to census records of occupations) also worked by various Shores. The two are the Gun Lane colliery and the Ridgeway Lane colliery, both referenced on your website. I will be 'mining' your site for any information that is there, but I wanted to touch base with you to ask if you might be open to a dialogue, and whether the Shore story would be of interest for inclusion on your site. Neither mine was particularly large or productive, from what I can tell, but nonetheless, an interesting part of the story of the Shores of Heage. I would be happy to edit the story I've written to suit. I am a few years away from retiring, so my research gets done somewhat erratically when spare time presents itself. I would like to know about Rexco, all I do know is my dad worked at the plant next to Thoresby Colliery 1961 - 1973, his name was Ron Metheringham.